I always look forward to Tuesdays because we get our Community Supported Agriculture produce on this day of the week. Fresh, organic produce from a local farm - pure bliss! If you're new to The Granola Chronicles, feel free to read this background regarding CSA programs. As I've mentioned before, Evan always surprises me with flowers (he adds them on to our CSA order for the week without ever telling me). When I showed up to our pick-up location today, only one bunch of flowers was sitting in a bucket of water - there are usually 5-6 bouquets. When I got closer, I noticed that the lone bouquet had our name on it! We were the only ones who purchased flowers this week...now I feel really special! Let me show you our organic produce for the week! I think we may have won a prize. Check out those golden raspberries. I'm thinking this is the crunchy/granola version of Willy Wonka - and instead of a tour at a chocolate factory, we'll go visit farmers at an organic farm! 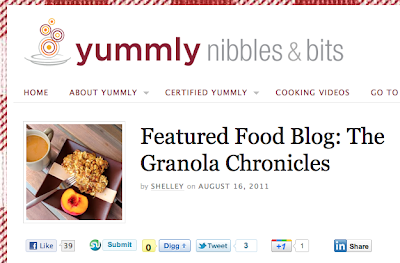 So I did a little searching on the blog, and I think we've received strawberries every week since the beginning of April. Amazing, right?! We also got pluots this week. So darn exciting! And another green...in the form of a bean! And finally some beautiful tomatoes and cucumbers (which make a wonderful combo in my book!). Pretty decent haul, as always. 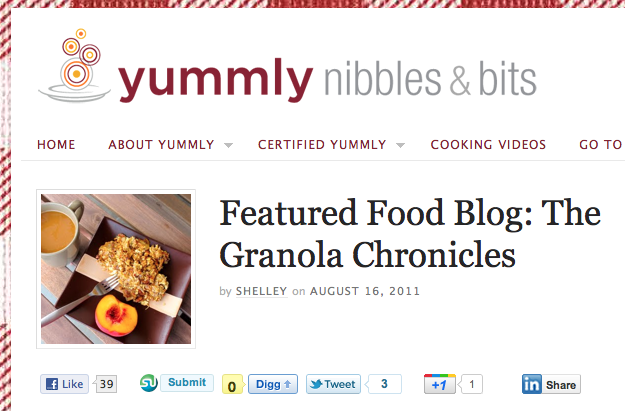 In other news, Yummly featured this little ol' blog today! Alright, I need to go for a run, hit up Target, respond to emails, make dinner, and drink some wine (duh). Hope you have a lovely evening!